Lemons are sour, but with the right ingredients they turn into a refreshing, sweet treat. We’ve all heard the saying, “When life gives you lemons, make lemonade”. That’s one of the decisions I made at the beginning of this year. To make lemonade with the lemons life throws at me. It’s no wonder they’re yellow. Yellow is such a cheery color. One of the additudes that yellow symbolizes is optimism. There is so much negativity in the media. So much fear-inducing information. It is easy to complain and grumble about it all. It is also easy to complain and grumble when things don’t go our way. When our comfort and personal peace is being threatened. Life will always throw us lemons. The secret lies within what we do with them. Yes, I think I’ll squeeze mine into some refreshing water and add some sweetener. How about you? How do you handle the lemons life throws at you? Original illustration and Tanaga poem. Have you ever been deeply impacted by a song? I have. The above poem was inspired by the song ‘Killing Me Softly‘. 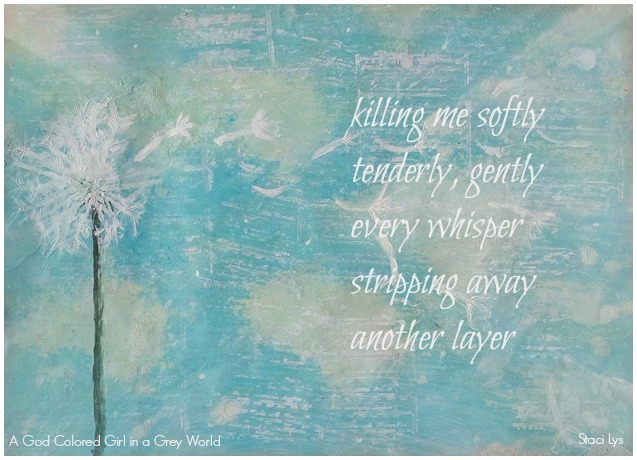 I actually posted this poem recently, but I wanted to put my own mixed media art piece to go along with it. I had the idea to use a dandelion, because I thought it apropos for the message. Once the dandelion has reached it’s life’s end, the wind comes along and blows its seeds all about, falling where they may. Then new flowers are born. Strong flowers with deep roots. Pesky weeds to many gardeners, that’s how strong their roots are. It makes me think about my own experiences. 10 years ago I sensed that God was sharing a message with me through this song, and just recently I sensed that he was showing me that he has been killing me softly throughout these years. 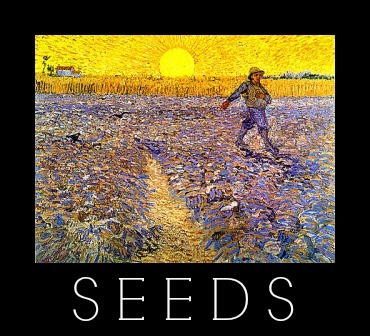 The wind of His spirit came and blew away what needed to die, but those seeds fell and produced new life. New life that has deep roots. New life rid of the old and weak. Have you ever been deeply impacted by a song? Which song? How did it change you? Unfortunately, I don’t have the type of brush to be able to do fine details like the swoops on the dandelion. I guess we can’t be pleased with everything we do. If you would like to read the original post that inspired this poem, you can do so here. Salt serves to season, preserve and disinfect. Metaphorically, it has symbolized loyalty, fidelity, usefulness and purification throughout history (source). Light chases away darkness. In fact, darkness is the absence of light. And so I present to you this simple art piece and poem. My prayer is that I will bear much fruit. Beautiful fruits of love, joy, peace, patience, kindness, goodness, gentleness, faithfulness and self-control. I know that in and of myself it is impossible. But then again, I guess that’s why these fruits are called, “The fruit of the Spirit”. As I remain in Him and He in me, these fruits are possible to obtain. Do you believe yourself to be a person full of these fruits? Which area is your greatest struggle? For me it is patience and self-control. Just a quick note to let you know I will be traveling on Friday and will be gone for about two weeks. I will not have regular access to the internet while I’m gone. Color can make a difference in a person’s life. What do the colors mean to you? Which color would you say most reflects how you feel right now? What does that color mean to you? Have you ever thought about your words and how they can affect others? Who ever created that famous nursery rhyme, “Sticks and stones may break my bones, but names will never hurt me”, obviously didn’t know what he was talking about. Words and very powerful. Just as actions are very powerful. I am a mother of two young children and, for me, it is very important that I watch my words and my actions around my children. I have an amazing responsibility to raise two little human beings, and I don’t take that lightly. With my words, I can either make or break my children. I can generate in them thoughts that are either healthy or hurtful. Essentially, I am planting seeds in the fertile soil of their minds, and they, like sponges are taking it all in and forming their thoughts, worldview, character, opinions, etc. Now I don’t know about you, but it seems to me that our words ultimately have extreme power. Let’s take great care then and think twice before we speak. How about you? Have you ever thought about the effect that your words can have on someone, especially someone you love? Have you ever experienced the crushing pain of hurtful words? I know I have. If you are a parent, how important is it for you to plant good seeds into the soil of your children’s minds? Have you ever considered the effect that your words can have on them? Just some food for thought on a Wednesday afternoon…. Yet another post about patience. Do you think it’s been on my mind? 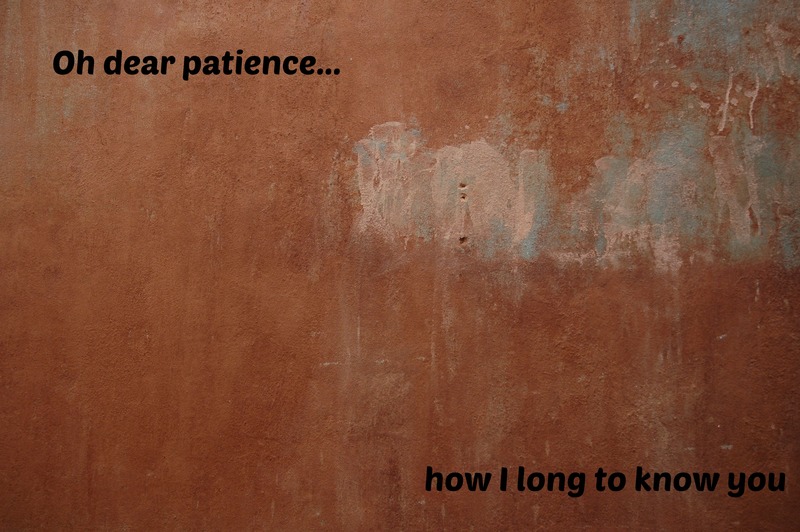 Oh dear patience, how I long to know you. And bit by bit, thanks to circumstances and life in general, you are becoming a better friend. I don’t like to admit it much, but yes, I am an extremely impatient person. I have never liked standing in line, waiting for a bus, putting up with phlegmatic individuals that like to take their own sweet time – and of recent years, waiting for my children to get dressed, brush their teeth and get into bed, finish their lunch before school starts, and the list goes on. Now when one asks for patience, one must not think that it will come to them in the wink of an eye. It just doesn’t happen that way. Patience is something that comes, well, patiently. It is a virtue to be acquired. It is something that takes time and diligence. It is a choice. You choose to pursue it because it doesn’t come naturally. There are consequences that come with acting out of impatience. I have experienced them one too many times. Being a strong feeler and highly impulsive has led me down some very potentially destructive roads. I’ve had my hair cut by an unexperienced barber because of my impatience with the salon next door that was taking too long to get to me. I ended up with a horrible haircut that was uneven and a lot shorter than I wanted. Being a mother of a child with Asperger’s Syndrome, my patience has been tested time and again. I am a Canadian and my first language is English. However, I live in Brazil and have acquired a second language – Portuguese. My children are being raised bilingual and study at a Portuguese-speaking school. Brazil is about 40 years behind in understanding and dealing with the issue of autism and those who are on the autism spectrum. I chose not to home school, but to put Cauê in a school that is eager to include those with learning disabilities and those that aren’t ‘neuro-typical’. He desperately needs the social interaction and I recognize my limitations and lack of – yup, you guessed it – patience. Even though the school accepts my son and tries to adapt lessons for him and his learning style, I have to invest a great amount of time and energy into helping him understand what is being taught. Apart from his regular homework, I am also teaching him to read in English. This has added to my stress and tested my patience many times over. I had a dream recently where I was with my children and we were walking along a quiet residential street. All of a sudden, Cauê ran ahead, where at the intersection was a busy street. I called and yelled out to him, STOP Cauê! I tried running after him, but couldn’t catch up on time. I never saw him get hit by a car or anything like that, but all of a sudden I was aware that I was trying to rush him along and get him to read in English at the same level as a neuro-typical child that lives in an English-only environment. I knew that if I continued in my impatience and forcing him to get to a place that he wasn’t ready to be, I would end up traumatizing him and killing any desire to read with me. I am determined to master the art of patience. And with any art, practice makes perfect. It is something you have to work at. It is like a talent to be honed. I read a story once about a great painter that painted a beautiful masterpiece in 10 minutes. When asked how long it took him to paint it, he replied, “20 years”. Patience is also a BI-product of wisdom. Wisdom is a BI-product of life experience. 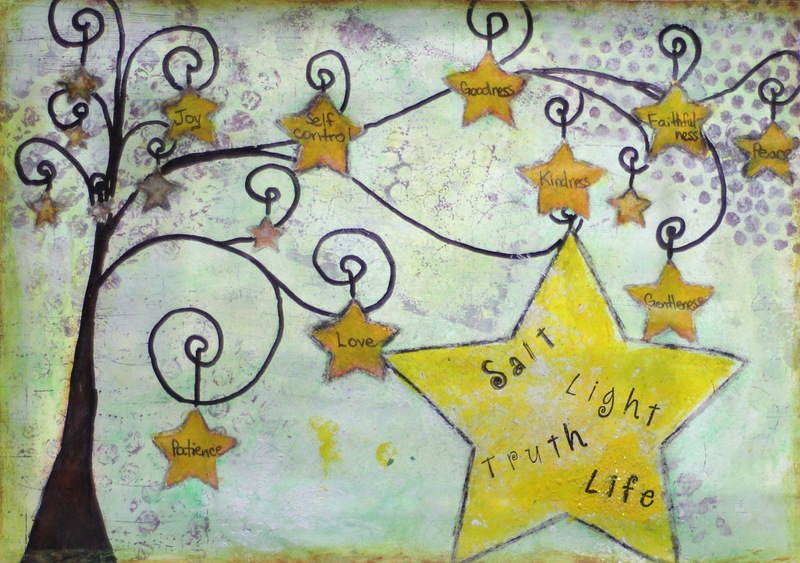 Life experience will produce wisdom and teach patience as we approach our experiences with teachable hearts. Do you struggle with being patient? What have your life experiences taught you? Ok, we’ve all heard it before. True beauty isn’t what’s on the outside, our physical appearance. True beauty is what is on the inside, and this is true. I know that I aspire to excellence in character, even though it often doesn’t seem like it (my hubby and kids can tell you some ‘not-so-nice’ stories). The Bible also talks about how “charm is deceitful and beauty is vain, but a woman who fears the Lord is to be praised” -Proverbs 31:30. Women can be very powerful by using their beauty to entice men or for selfish ambition to get what they want, unfortunately. Of course we should never try to make ourselves beautiful with the intention of attracting the attention of some man that’s not our husband or because of our greediness or covetous desires-using our beauty as a tool to get what we want. I do, however, have to wonder why I feel so yucky and down when I don’t look beautiful or when I don’t put any effort into my physical appearance. I can’t help but think that if God is the author and designer of beauty and if he made women beautiful, with breasts, soft skin and curves, then what’s the problem with paying attention to how I look, dress, or physically present myself. I remember when I was doing a music school in Australia, the girls/young women generally didn’t really take care of their appearance or place much of an importance on it. I remember overhearing one girl say to a group of friends something along the lines of how she doesn’t dress nice in day to day life because when some special event did come along and she dressed nice and put that extra effort into her appearance people would think she looked AMAZING! My husband thought that that way of thinking was ridiculous (he’s Brazilian and generally Brazilian women don’t think that way). I didn’t think it was ridiculous, however, I did think that it was kind of a mentality or way of thinking that had developed amongst this certain group of people. Throughout the duration of my school, I always took care to dress and present myself in an appealing way. Not for anybody else’s benefit, but for my own. I had one girl send me a note once, along with an old skirt of hers that I really liked, and on the note it said that she wanted to give me that skirt as a gift and that she thought that I was such an elegant woman. I was really blessed by that comment. All because I took an extra few minutes in the morning to place an importance on how I looked. So what I believe it comes down to is that human beings are extremists. We have a difficult time sometimes being balanced. Yes, the Bible talks about true beauty coming from within, but God is also the maker, creator and designer of beauty and has made women beautiful, and men appreciate that. What man doesn’t want to see his wife beautiful, taking care of herself, and enhancing her natural beauty creatively? I know that when I do my husband takes note and appreciates it. He tells me I’m beautiful. And what woman doesn’t like to hear from her husband that she’s beautiful? Don’t get me wrong though. I don’t believe that beauty is just simply appearance. There can be an extremely attractive woman with bad character, and because of her character, she becomes unattractive/ugly. My husband once told me that if he sees a beautiful woman smoke, she’s no longer beautiful. Physical beauty isn’t anything without purity and good character. But physical beauty becomes the icing on the cake to a woman of purity and good character. What do you consider to be true beauty? Please leave a comment and let me know what you think; I’d love to know.